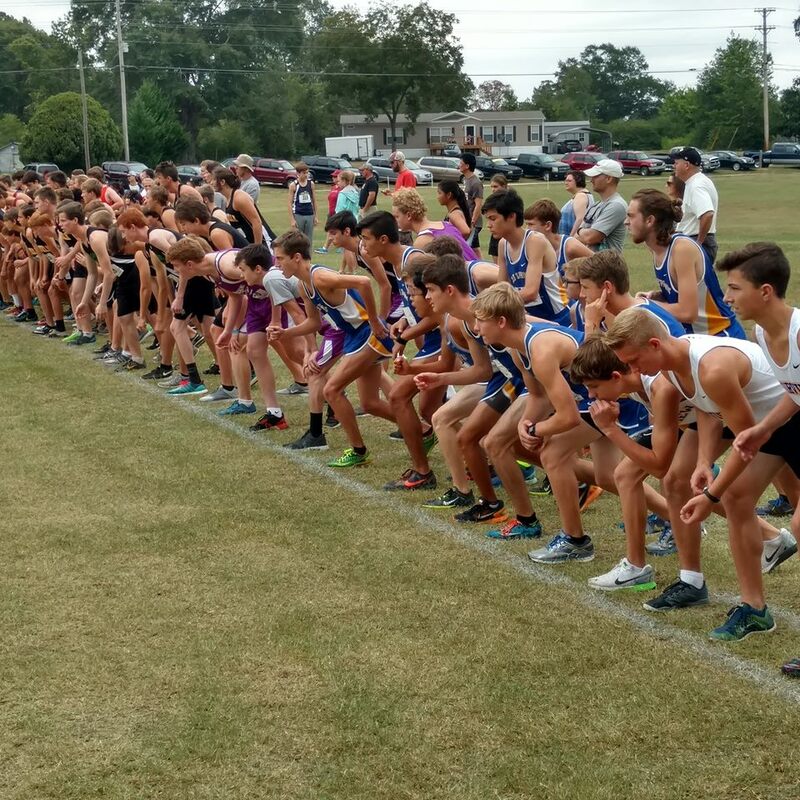 FAIRVIEW – A cross country rivalry between Cold Springs High School and St. Bernard Prep School continued on Saturday in the Fairview Invitational. Two of the top programs among the smaller classifications in the Alabama High School Athletic Association went down to the wire. Cold Springs edged St. Bernard by a point in the varsity division with the Lady Saints coming out on top as the Lady Eagles took home third. A total of 201 runners took to Fairview Town Park with pleasant conditions for the participants as they dealt with cloudy skies, a slight breeze and temperature in the upper 70s. It was very different than what the two schools had seen in recent weeks on the course. In the tightly contested varsity division, Cold Springs had 41 points with a first place finish, followed by fourth, 11th, 12th and 13th. The Eagles nipped the Saints who had 42 points, scoring their total on second, third, sixth, 15th and 16th position. Senior Jared Stanley crossed in first with a time of 16:40.55 for the Eagles, getting by St. Bernard's Casey Guthery who was runner-up at 16:45.79. Andrew Sweeney of St. Bernard finished third at 17:05.67, C.J. Lang of Cold Springs fourth at 17:09.45, Marco Tona from St. Bernard sixth at 17:47.88 and Fairview's Cody Fallin with a respectable finish of seventh at 17:49.67. Holly Pond runner Jacob Drane took home eighth with a time of 17:52.32. Jonathan Collett from Cold Springs earned an 11th place finish at 18:04.79, Mason Harris 12th at 18:08.22 and Trentan Williams 13th at 18:08.71 to round out their scoring. Isaias Robles of St. Bernard was 15th overall at 18:22.54, teammate Caleb Guthery 16th at 18:33.75, Quinton Chambers of Fairview 17th at 18:45.79, teammate Jacob Guthrie 19th at 18:51.99, Will Butler 24th at 19:14.86 and Austin Lowe 25th with a time of 19:19.62. Fairview was fourth behind the Eagles, Saints and Hartselle with 92 points. Holly Pond captured fifth place with 186 points. Twelve varsity teams battled it out on Saturday morning. St. Bernard Lady Saints were anchored by the talented Leahrose Mami, who claimed the title with a winning time of 20:10.36. Finishing behind her was Lauren McHan of J.B. Pennington at 20:28.36, Ivy Edge from St. Bernard third at 20:51.36; Holly Pond eighth-grader Camilla Chambers was fifth overall with a time of 21:05.90. Invitational host Fairview had a strong run from Alex McDonald with the sixth fastest time of 21:51.93. Sadie Terry of Cold Springs was 11th at 22:21.12, Claire Sanders from St. Bernard 12th at 22:25.57, Alyssa Jackson and Ava Akridge of Cold Springs were 14th and 15th with times of 22:33.50 and 22:40.02. Jaden Edge from St. Bernard placed 16th with a time of 22:47.21, Brooke Crider from Cold Springs was 18th at 22:55.90, Emma Gardner from Fairview 20th at 23:02.26, Tiffany Lodge of Fairview 22nd at 23:25.00 and Lizbeth Medina 23rd with a finishing time of 23:28.31. Team scoring had St. Bernard winning it with 55 points, Brindlee Mountain a distant second at 85, Cold Springs third with 107, Fairview fourth at 118 and Pennington in fifth place at 127. Good Hope won the junior varsity division with 47 points, St. Bernard finished second with 54 followed by Hartselle in third place at 72. Will Rhodes of Vinemont earned third place with a time of 12:10.61. Francis Ratji from St. Bernard came in fourth at 12:29.53; Good Hope's best time was Michael Lowe in seventh place at 12:45.24. The Raiders placed their top five runners in the top 19 to take home the JV crown. Anna Beth Guthery of St. Bernard got past Fairview's Brianna Lodge in the junior varsity girls by a time of 14:26.13. Lodge was behind her with a finishing time of 14:31.93. St. Bernard was victorious with 24 points to 31 for runner-up Brooks. St. Bernard and Fairview will journey to Cranford Stricklin Stadium next weekend for the 12th annual Kudzu Run, hosted by Cold Springs High School. Approximately 50 teams have entered in the varsity and junior varsity divisions less than a week before the event takes place.